I've never had a kid as attached to a lovie as this one. 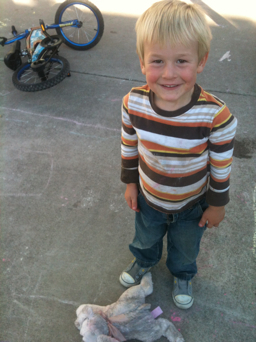 We sent Nate and Grandpa all around town retracing my steps to try and find the bunny. After an hour of attempting to get my easy girl to take a nap, I loaded the kids up and retraced my steps myself. No bunny. We have had a second bunny around the house for some time. We've never needed it and she doesn't care for it. 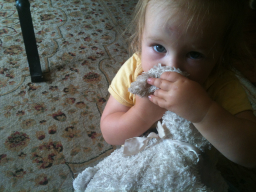 The back up bunny is an exact replica of her bunny minus 18 months of dirt and sweat and love. Big brother and Big sister were happy to attempt to dirty up the clean bunny so that Ingrid might accept it as a cuddle partner. She was not fooled. And this mama is not ready for her to give up her lovie yet. I love that Claire and Ev tried to help, but sorry the little one lost her lovie. I hope by some miracle you find it.